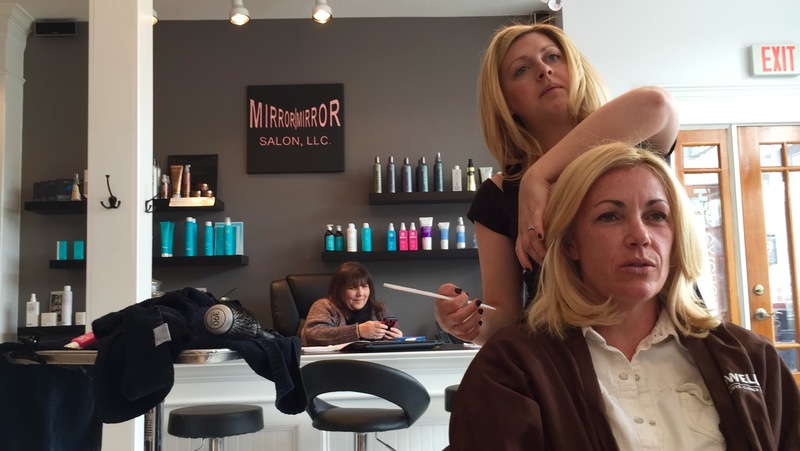 One year after opening her full-service hair salon in downtown Newburyport, MA, Mirror Mirror owner Monica Tufts-McNeil has no intention of waking up from her dream-reality. “For months I saved and looked around for the perfect location in Newburyport until one day, here it was! Parking, a new building, access to all major roads and surrounded by other industry professionals in fashion, fine-dining and cosmetology. My wish came true!” said McNeil. Coming from a large family of hairstylists, and having forever been inspired by the magic of Disney, Monica knew early on her career would center around her artistic visions. In an effort to combine skill with her creative innovations, Monica’s first professional step into the hair scene was through her studies at the Boston Blaine School of Cosmetology (Empire Beauty School). Now known for her superior blow drying techniques, Monica credits this mastered art to learning the basics right, and right from the start. “My education really focused on proper haircutting and styling techniques for all ethnicities. There’s not one head of hair I don’t feel comfortable working with,” said McNeil. Throughout her 10 year career Monica has continued learning, attending hair shows and evolving her skills to include hair extensions, and the perfect placement of individual eyelashes, working in posh salons on Newbury Street in Boston and on the North Shore in Andover, MA. While building loyal salon clientele, she also enjoys the success of working in editorial, including styling for Boston Fashion Week, Miss Florida and WBZ’s Kerry Connolly. With a passion for airbrushing, Monica is skilled in the the art of applying hypoallergenic makeup to create a flawless finish. “It’s the only sterile form of makeup artistry because the brush isn’t applied to the face. It’s also great for people who work on camera or have hyperpigmentation. I’m now getting a lot of requests from brides as well. I’ve even used it to cover tattoos and create amazing faces for Halloween,” laughed McNeil. In her (off) time, Monica is just as busy as she is inside the salon, hanging out with her black lab, Rambo, and Bernese mountain dog, Wilbur. “The night before Mirror Mirror opened in Newburyport, my Rambo was sprayed by a snuck. So there I was in the tub performing an emergency tomato hair treatment on my dog at 2 a.m. My life in entertaining for sure. Never a dull moment,” shared Tufts. In addition to her adventures with Rambo and Wilbur, Monica is under development on a home, and she just got married, in which she handled the hair and makeup for her entire bridal party. “Eric (husband) has been a great partner throughout this process. He’s by my side to help with everything from changing a light bulb, to managing the full renovation of the salon. Between him and my parents, I couldn’t have done it. They’ve always believed in me,” said McNeil. Now almost one year after the opening of her Newburyport salon, Monica has already added several professional stylists to her team, including Mindi Schena who has been doing hair for over 20 years, and nail technician Ti Phan, both of whom have helped Monica turn Mirror Mirror into a full-service salon specializing in cuts, color, blowouts and styling. 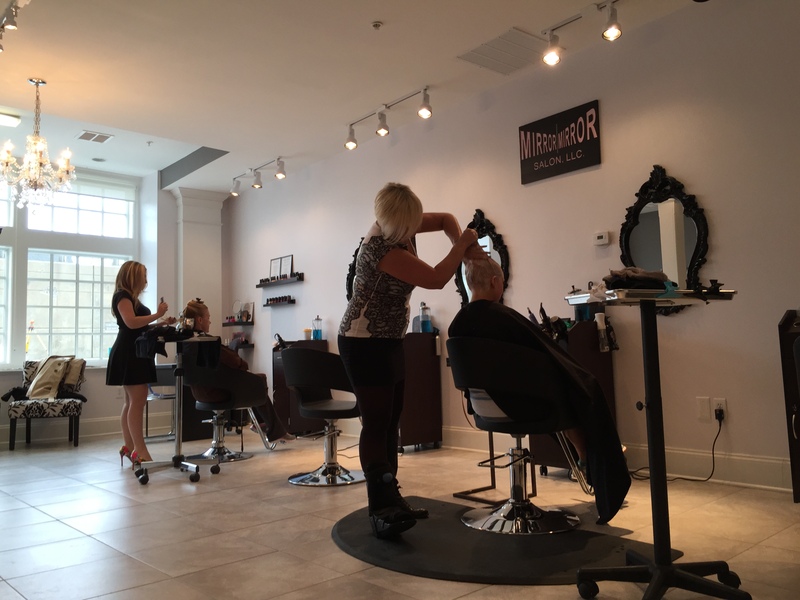 If you’d like to book an appointment with Monica, you can do so on their website at MirrorMirrorNewburyport.com. Appointments are Tuesday through Saturday, with special accommodations on Sunday and Monday. You can also get inspired by following Monica and the Mirror Mirror team on social media. They often posts their latest creations on Facebook, Twitter and Instagram. [Flickr Gallery] Mirror Mirror’s Photo Album SPOTlight. #SupportLocal + SHARE!